This is a variation of the Recipe of the Four Thieves who plundered the houses of people killed by the Black Plague during the Middle Ages. At first the authorities did not pursue them, feeling that they soon would be dead from contagion. When the four thieves continued to survive, interest changed from their crimes to their ability to not get ill. When finally arrested they exchanged the recipe for their lives. My version exchanges some unavailable or toxic herbs for those readily available and will kill germs and strengthen your immune system. It can be taken internally, used to kill germs externally, and can be used preventatively or to help knock out viruses or bacterial infections. Take it by the tablespoon in water or use on salads or preventatively in cooking. Lavender , Sage, Lemon Balm, Rosemary, Peppermint and 2 TBSP Chile Peppers, 8 minced cloves garlic and a one ounce tincture bottle of Artemesia annua. Blend ingredients in a glass jar and cover completely with apple cider vinegar. Cold infuse (let sit at room temperature in a cool place) for four weeks and then strain. Get a quarter cup of dry or 3/4 cup fresh Lavender, Sage, Lemon Balm, Rosemary, Peppermint and and Artemesia annua (wormwood, sweet Annie) and place them in a jar. Freshly dried herbs make the strongest vinegar. You can add or substitute thyme, oregano, bee balm (monarda), white sage or similar herbs. Basil tends to turn black and mushy. If you can’t find the sweet Annie, you can find a one ounce tincture bottle from a health food store and add it. Don’t be afraid to substitute if you can’t find all of the herbs. Many kitchen spices are medicinal, but they must be fresh. Article provided by wikiHow, a wiki how-to manual. 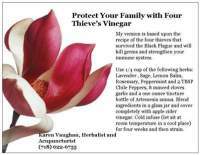 Please edit this article and find author credits at the original wikiHow article on How to Make Thieve’s Vinegar to Prevent Disease. All content on wikiHow can be shared under a Creative Commons license.